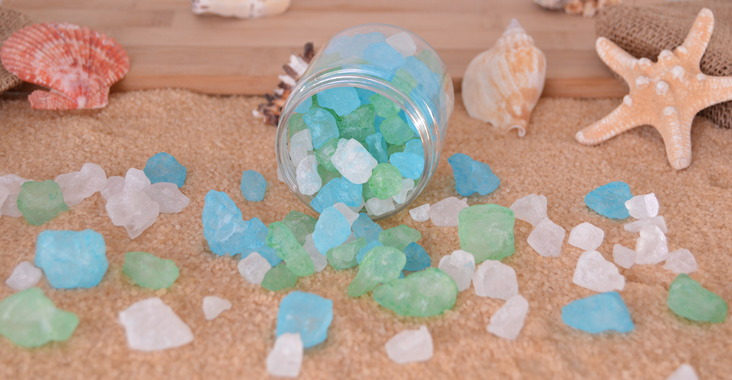 Sea Glass Bath Crystals are easy to create and make a great bath or foot soak! You can also place them in a wide mouth jar to be used as potpourri. Our Blog tutorial demonstrates a quick and simple way to make these beautiful, summer-inspired Bath Salts. The only tools you will need is a large stainless steel bowl for mixing the salts and rubber gloves so the colorant doesn’t stain your hands. First, add the fragrance oil into the whole batch of salts and mix well. Then separate the scented salts into 3 equal portions. Add the blue colorant to one portion and mix until the color is completely dispersed. Repeat this step for the green and the Caribbean blue. Let the salts sit to dry out for one hour before combining them for packaging. For a more intense color, spritz the colored salts with a bit of rubbing alcohol and then mix them up a bit more. After you’ve mixed them, let them air out until the alcohol smell has dissipated before packaging. If you are able to obtain powder colorants or mica, we recommend using those over liquid colorant, however, if you can’t find the, the liquid colorants will work just fine. Notify customers that their bath water may change color, however, the bath crystals will not stain skin. Market these sea glass bath crystals as a multi-functioning bath product. They can be used as decoration, soap toppers, potpourri, a bath soak as well as a foot soak. The real savings happen when you buy the 50-pound bag of salt. It works out to cost 24 cents an ounce rather than the 60 cents per ounce, when you buy a 10-pound bag.